Gigha, a Highland cow that had to be rescued from a ditch, yesterday. One of two cows to be rescued by firefighters in the same day has died. Gigha, a 19-year-old Highlander, was put to sleep yesterday morning. 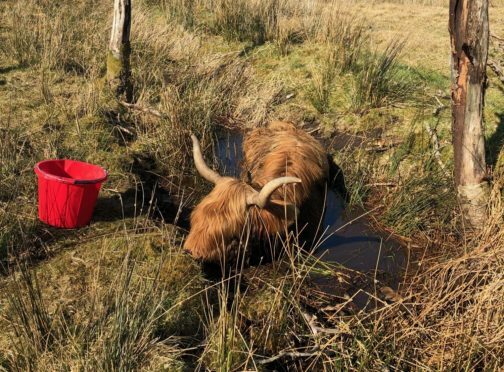 Firefighters in Fort William were called out twice in 12 hours to rescue cattle that had fallen into ditches and were unable to free themselves. Dolly, an 18-year-old home-bred Limousin cross from Arisaig was successfully rescued earlier in the day at 1pm. Owner Hugh MacDonald said she was continuing to do well. It was hoped that Gigha’s rescue, shortly after 6pm, had also been successful – but after treatment from local vets including electrolytes, calcium and stabilisation, she was euthanized. Nicola Muir, who had kept Gigha in a field at Banavie, Fort William, said that in spite of everyone’s best efforts the cow couldn’t be saved. Mrs Muir said: “The fire brigade were absolutely brilliant and the vet was here as well. Everyone worked together to get her out of the ditch. She was well and truly stuck right up to her neck. “When the fire brigade arrived on scene I said “you wouldn’t have seen this very often”, and they laughed and said this is our second cow rescue in one day. “We thought she would make it, when she came out at first. We did everything that we could do with calcium, electrolytes and other medications. “She was unable to stand on her own, we nursed her overnight but she kept going down onto her side. “We assessed the situation this morning and realised that the only thing that we could do in the end was to euthanize her and allow her to rest. “When I went to look at her cow passport I saw that it was her birthday next week on April 19, she would have been 19. “She was a bit of a girl in her time – she was born at Broadford on Skye, then at Strathaird, then she came to Torlundy, then Adnamurchan, Strontian, Camaghael and eventually to us in 2010.